Sequencing Technology: Where’s my MinIon!? 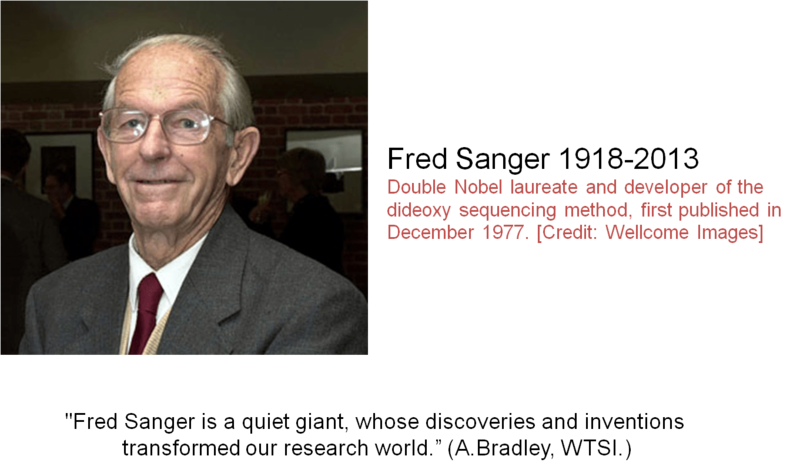 Konrad gave a lovely homage to Fred Sanger in his talk because if it weren’t for Dr. Sanger we really wouldn’t have come as far as we’ve come in sequencing technology so quickly. Maxam-Gilbert Sequencing: Based on chain breakage of DNA, nasty chemicals, radiolabels and sequencing gels. Nature pub group (see Mammalian Genomes post), publically funded, shotgun BAC approach. Science group: A Venter venture (private but data publically available). Wanted to do the genome faster for less than the publically funded group. Different method: Shear DNA, sequence the small fragments and rely on bioinformatics for assembly and scaffolding into a genome. Raise ethical concerns about ownership of genomes and the idea of patenting genes. What has the Human Genome Project given us? Common features of all sequencers nowadays are they use adapters to fix DNA, some form of PCR amplification/library creation, fluorescent probes, all can do paired-end reading, most can sequence a human genome in a day, all require post processing of data for quality control, on average shorter read lengths than Sanger, capable of high volume. With the upgrade to 2500 you can produce 1 billion reads in 2-9 days using a flowcell, depending on how you use it. (ave length 18-150 bp). It’s the difference between obtaining a human genome from 1 sample in 27 hrs (rapid) or 5 samples in 12 days (High througput). 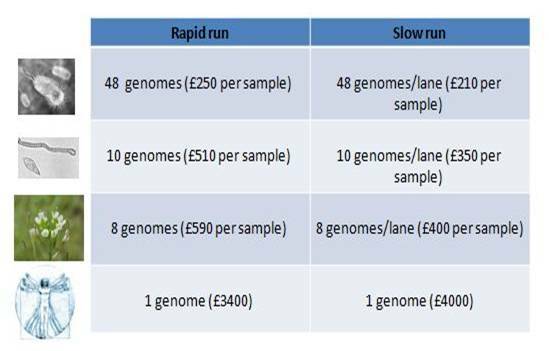 For us bacteriologists: You could either do 48 genomes amidst all ‘lanes’ available in cell (rapid) or doing 48 genomes/lane (high throughput but longer). Pros: long reads (200-1000 bp), multiple samples at once (multiplexing), short run (1 Gb/3 hrs. Also relies on emPCR protocol. $700/run, $50K/instrument + $75K/library prep system. Meant for shorter reads. Unfortunately, libraries are not compatible with Ion Proton. Want to learn more about sequencers? Loman et al., 2012. 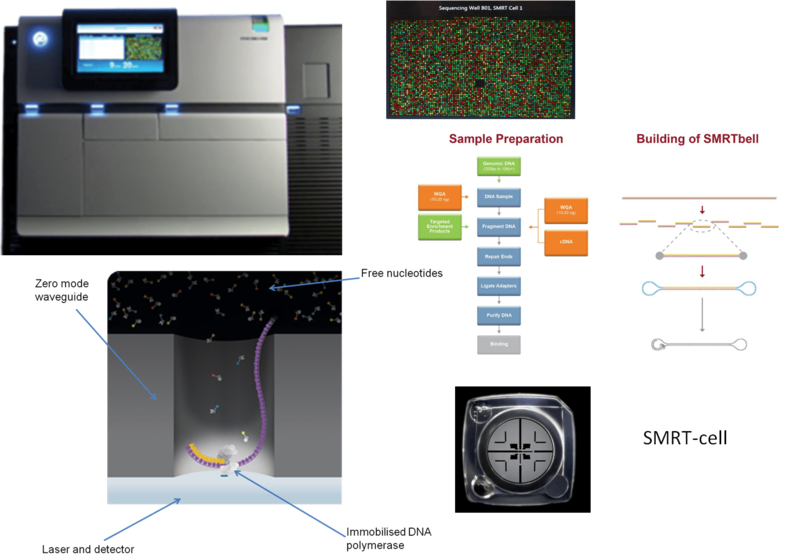 Performance comparison of high-throughput sequencing platforms. Nature Biotechnology. 30: 434. Sequencing is only going to be as good as your sample prep, so if there’s contamination or degradation, that’s what you’ll get out of your sequencer. When your organism has a high bias toward GC or AT then it becomes more difficult to sequence. 454 and Ion Torrent have problems with homopolyers, Illumina has this problem too but to a lesser extent because of their specific PCR protocol that incorporates ‘blocking’ via a terminator at the end of each cycle. Need to be reminded what a homopolymer is? A long stretch of a single nucleotide in a DNA sequence (ie. AAAAAA). The longer the stretch the less ‘confident’ the machine becomes when reading the nucleotides, signal is ‘maxed’ out and you end up for varying numbers of that nucleotide in the output that will need to be resolved. 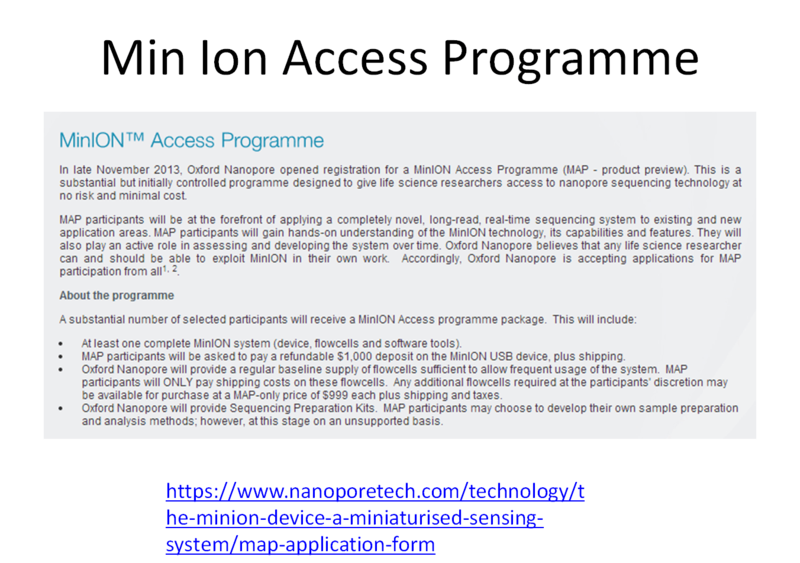 PacBio has a machine available. Basically the machine is designed to collect absolutely ALL the light given off by the photon that occurs when a base is read. This system requires library prep (so some bias may still be inevitable as with current systems). The nifty thing about this system has to do with it’s potential applications to epigenetics. Because they slow the reaction with the polymerase and methylated bases take longer to disassociate than non-methylated bases–they can measure the ‘time’ and determine the DNA that is methylated while sequencing. Also you can circularize DNA and sequence the same molecule over and over. Theoretically you can get fragments up to 10kb, the process is 40 min (minus prep). Currently it has about a 15% error rate though, is uber-expensive ($750K) and you only get 10-100 Mb/run. 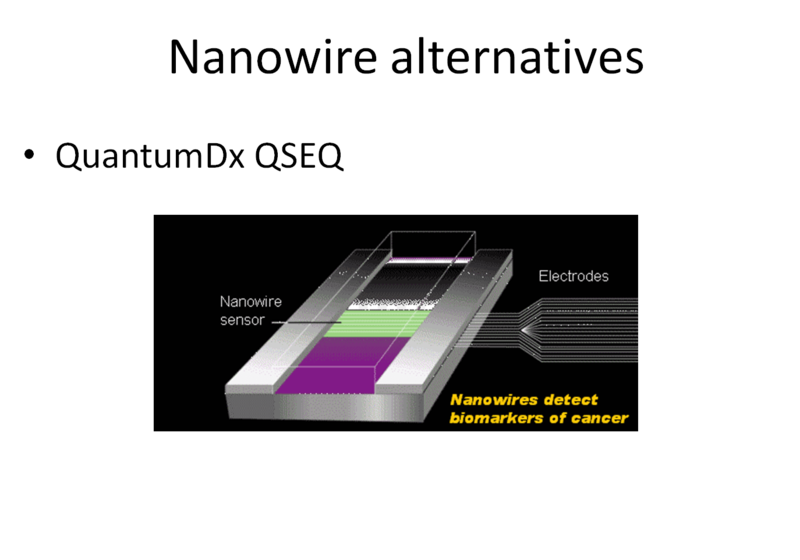 This method developed by Oxford Nanopore, uses–you guessed is ‘a very small pore’ and electrical current to detect DNA. Different bases will elicit a different signal when reacted with the electrical current. No library prep is the goal of this technology as well as the possibilities for parallelization. However, DNA moves really quickly and they haven’t found a way yet to either slow the DNA down enough or make the pore thin enough to force one base through at a time. Currently, they are at 4-5 bases at a time. There is also a lot of electrical noise generated so teasing out your signal is challenging. They came up with two methods. Strand Sequencing: A pore that slows DNA down via it’s design to 4-5 bases at a time. Exonuclease sequencing: An exonuclease chops the DNA and slows it down so it ‘falls’ into the pore hopefully 1 to a few bases at a time. This may post an indel problem similar to what’s afflicting current methods today BUT has prospects for sequencing proteins, polymers, small molecules and possible replace mass spectrometry (though that’s a ways off). GRIDIon (possibly around $30K) is said to be able to sequence a human genome in 2 hrs for $1000. 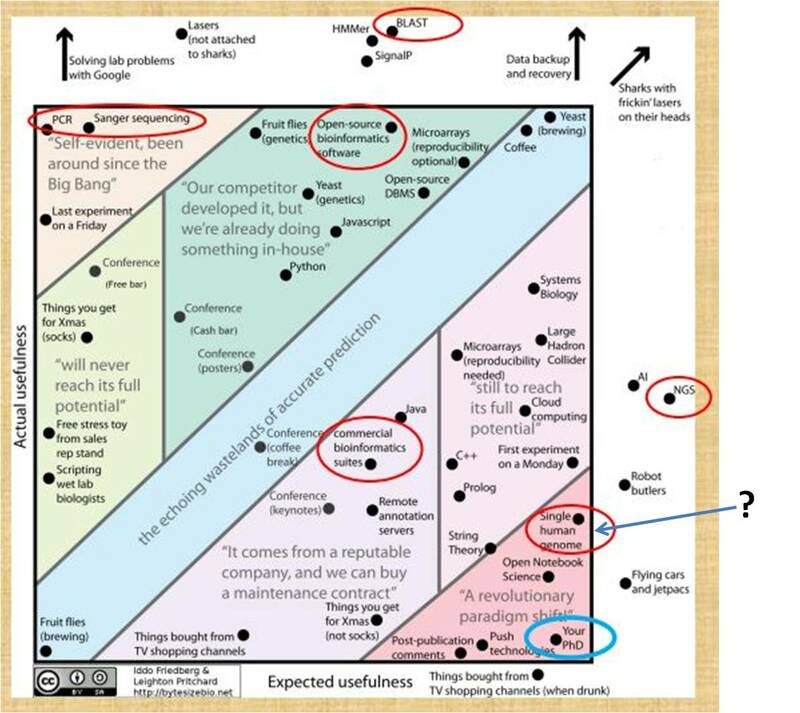 And what’s in store for the future??? 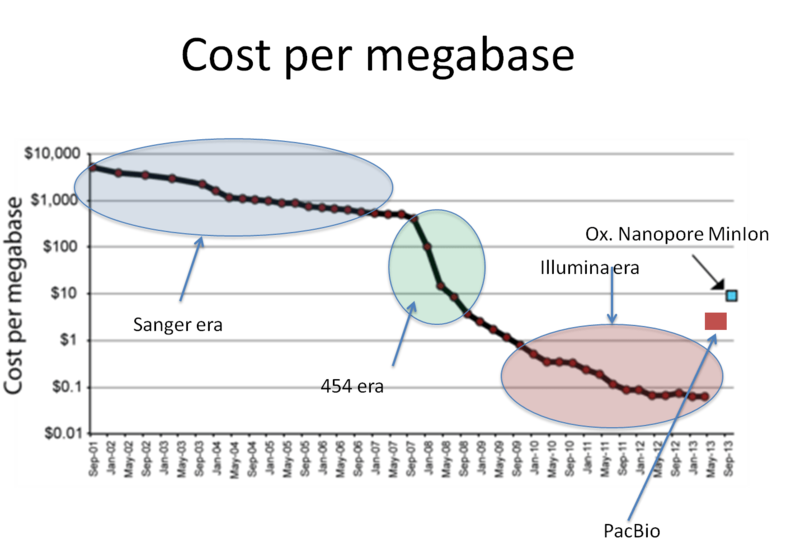 A great paper to read that puts all the mass sequencing in perhaps a more realistic light. Gerlinger et al., 2012. Intratumor heterogeneity and branched evolution revealed by multi-region sequencing. New England Journal of Medicine. We can sequence and sequence and sequence, but without biological and environmental context…it means nothing. So why don’t we have our MinIon’s yet? A bit battier, that is, than we obviously already are.